For those of you who followed along with my first pregnancy, you know that I had complications in the end—specifically an intestinal blockage—that led to a series of hospitalizations, a dreaded NG tube, and ultimately to my induction just before 36 weeks when I gave birth to my son. So obviously, we had some things to consider when we discussed the idea of having another child. So how do I plan to make this pregnancy different from the first? Well, in all honesty, I’m not sure that I can, but I sure as hell am going to try. While I was being cautious with the foods I ate later in my first pregnancy, I realize now that I was not being cautious enough. There were a couple of times that I ate things that were probably a little too risky. Knowing now what the consequences of that can be, I will be sure to be more vigilant in making sure that I avoid problem foods and make smarter decisions. I have already noticed a time or two that I have felt a little blocked up, although nothing that some extra hydration and careful eating couldn’t fix, but it does make me wary about how the next few months are going to go. I have bandied the idea of going on a mostly liquid diet during the final weeks, but the reality of living for 10+ weeks on a liquid diet when you’re pregnant would not be an easy task. At the minimum, I will be employing a some sort of low residue diet during that time, in hopes that I do not run into the same issues I experienced last time. But other than some extra caution and some food avoidance, I can’t say that I have done anything differently this time than I did the first time. I have been trying my best to stay hydrated, but that’s a constant struggle, pregnancy or no pregnancy. I am prepared with some larger sized wafers for once my stoma grows, which I expect it will again, and potentially prolapses. Even with the complications last time, I am still not considered high risk by my obstetrician. I do know they’ll be keeping a slightly closer eye on me, especially as I progress further along in the pregnancy, but the ostomy really doesn’t change any of my treatment, unless there is another complication. For now, I am focused on trying to eat healthy, but smart from an ostomy stand-point, drink lots and lots of water, and hopefully enjoy a complication-free pregnancy. 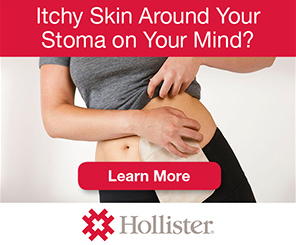 This entry was posted in Motherhood, OstoMOMmy, Ostomy, Pregnancy, Stolen Colon and tagged blockages, colon, colon bag, family, health, IBD, ibd blog, ileostomy, ileostomy bag, ileostomy blog, life, ostomy bag, ostomy blog, parenthood, pregnancy complications, stoma on February 6, 2017 by Stephanie Hughes.